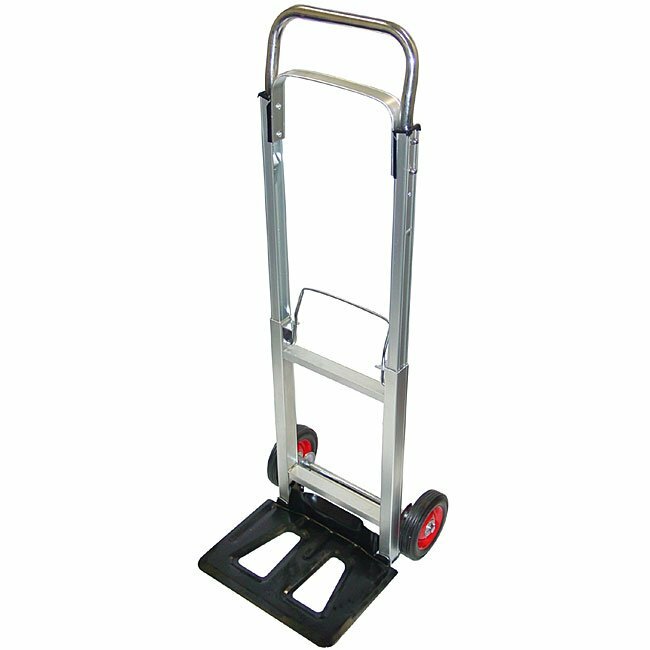 This lightweight hand truck is made of aircraft aluminum for strength & durability. Handle extends for large bulky boxes. Folds for convenient transport or storage. Extendable handle for ease in moving large loads. Maximum capacity 220 lbs. Base folds flat for easy transportation and storage. Big 6 inch solid rubber wheels for easy movement when loaded. Durable and lightweight aluminum construction. Weighs 15 lbs. The folding lightweight folding hand cart was very helpful to me when I moved from one house to another for downsizing. great hand truck. Fits in my trunk. Holds a few cases of wine. Can't beat the price either. I will say that I would reccomend this to a friend. In truth, the unit has done a fair job. I used it to be a window cleaning trolley. Its function is to carry a control box with small 12volt battery,12lbs in a plastic box with a small 4litre per minute pump and 4.5 gallons of water in a plastic jug 36lbs, like the size and shape of a vegetable oil box. The collapsable feature makes it possible for me to put it all in a car or van and assemble it at the job site. It has worked very well with one exception. The release lever usually sticks on one side and I have to pry it over with my closed pocket knife. My customers love the trolley and the results I get my equipment. The hand truck handles the load very well. The awkward opening and closing makes me look like amature hour. I need a strong colapsable hand for those times when I have a heavy items to transport. 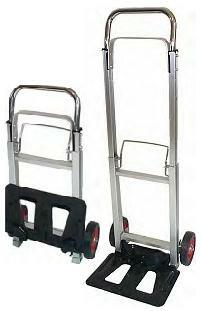 This hand truck fits in trunk and opens to carry very heavy loads. This little hand truck is worth its weight in gold. It has served me well on three occasions and it has assisted the neighbors as well. I'm very pleased with its construction and its ability to get the job done. It is sturdy and works fine. Depends on exactly what you need it for. For a trade show you would be better off with a flat cart to get more done more quickly. This fits folds and fits well into a hatch back car. Better than another product that wasn't sturdy enough and the cost was only a little more. Good for household and garden hauling jobs. I bought this product to transport wine case to and from my car and to the restaurants and shops I deliver to. I carry 3 cases at a time, ~110 lbs. So far the cart works well, folds up easily to carry in my car. I have some worries that over time some of the connections will give out the cart rattles quite a bit over bumps, but its a big improvement over the inexpensive plastic job I got at Costco. Well built and strong enough to hold my very heavy marine battery and electric motor from the parking lot down to the boat dock on the lake. This hand cart is wonderful!! It folds up small, rolls and carries great and was a very economical purchase. It is serving us well! Able to take a case of paper without any problem. Sturdy great construction. A definitely a great produce with good price. Sturdy, but not too heavy. I bought this to transport a couple of 20 lb. batteries around, and combined with some Velcro straps, it worked just great. Needed a solidly built hand truck that could also fold down to a smaller size to fit under a table at trade shows and in the trunk of the car. There were plenty of flimsy part plastic options out there at the major retailers, but I broke two of them at separate convention centers. This hand truck is all metal and perfect for my needs. Functional when I go on scuba diving. This handcart is far better than I expected. It lives up to and exceeds the advertisment. In my opinion it would be worth every cent at double the price. I am a delivery driver with limited space in my truck. The folding carts I bought previously were tubular aluminum and bent when I got very much weight on them. Also,packages would fall against my hand due to the flat handle. This cart from Hand Trucks 'R' Us is much more solid and the slanted handles keep packages away from my fingers. I have and will continue to recommend this hand truck to my fellow delivery drivers. I carry telescope equipment to Central Park in New York City everyday and roundtrip that's 4.4 miles per day. I started keeping track of the mileage to see what value I got out of the truck and I have pulled it 272.4 miles so far and it is still in excellent condition! Thank you! A little bit of a wait for shipping. But a wait that was worthwhile. I have the fold up hand truck, it folds so flat that you hardly know it's there. And is pretty strong also. I bought this cart to use to deliver cases of drinks to stores. It is perfect, but I am careful to not overload, but it does easily handle 6 cases of 24 can of 16 oz drinks. It could probably handle more, but this is the 150 lbs recommendation, so I don't want to abuse it. The hand cart is very light weight but very sturdy. So far, I have not found other cart close to the value. I am going to order 34 more for my crew. works great and very useful around the house and yard. I love this cart for moving my equipment from venue to venue and practice to practice. It is lightweight but carries a heavy load. Very versatile. The hand cart does all that it promises around the house. I have yet to use it on stairs, but, that would be highly unusual for me. The cart is well made and sturdy and is very much worth the price. The only drawback for me, is the smell so my rating is great. We ordered this cart a few months ago and were so happy with it that we ordered another one last month. They are easy to store and handle plenty of weight. I highlight recommend this cart in an office setting. I do a lot of craft shows, and got this hand cart for moving products. Its great, has a big enough platform to hold stuff with the help of a bungee. Glad I bought it. Five out of five stars...prompt delivery and good quality. I would recommend this to anyone. Folda Cart is more cart than needed for my intended use. 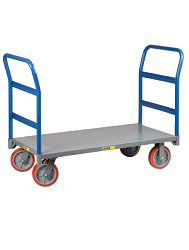 The cart seems to be constructed well and made for heavy duty use.